The manuscript room of Manhattan’s 42nd Street library is only one of the danger zones when the library’s crime fiction curator once again finds the stories he deals with professionally bleeding over into his private life. Raymond Ambler thinks his biggest headaches are curating an upcoming event celebrating 150 years of New York mystery and continuing to battle wealthy Lisa Young for custody of Johnny, the grandson they share to the exclusion of any other mutual ties. More acute problems arrive on the heels of what should be good news: novelist Paul Higgins’ offer to donate his papers to the 42nd Street branch. Since Higgins served for more than 30 years on the NYPD Intelligence unit before retiring to write thrillers, the cache of material is potentially red-hot, and it’s no surprise when Higgins makes an embargo of some especially sensitive material a condition of the donation. 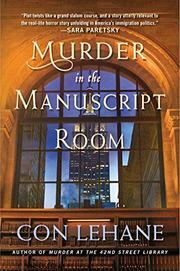 The first surprise comes when Higgins changes his mind and hands the files over to Ambler (Murder at the 42nd Street Library, 2016) after snatching him from outside his favorite bar and driving him to a secluded spot; the second is when Leila Stone, a research assistant in the Manuscripts and Archives Division, is found dead in Ambler’s office, the mystery reading room. After telling Ambler that he foolishly revealed the news of the donation to somebody he shouldn’t have but refusing to tell him who, Higgins goes AWOL, leaving Ambler stuck in the middle between Higgins’ shadowy former associates, a suspected terrorist whom Ambler’s co-worker and friend Adele Morgan has taken under her wing, freelance security chief Brad Campbell and his minions, the Department of Homeland Security, and whoever killed Leila and is perfectly willing to kill again.